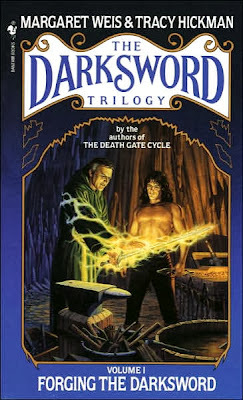 Forging the Darksword is a 1987 fantasy novel by Margaret Weis and Tracy Hickman, the first in their Darksword trilogy. Here, in a world where nearly everyone has some sort of magical power, the crown prince is born without it; thus a candidate to fulfill a prophecy of the world’s destruction, he’s sentenced to death. A world where everyone has magic is reasonably fertile storytelling ground, and to their credit, the authors have created it in such a way that it bears no resemblance whatsoever to Piers Anthony’s Xanth world, which is what the basic premise calls immediately to mind. The authors have also done a thorough job of setting up this world’s society. In spite of their best efforts, however, the characters’ dread of even rudimentary technology feels a little bit silly. I suppose there’s a half-formed commentary on superstition and religious oppression in here that’s scheduled to be born in a later volume. The plotting is Forging the Darksword’s most serious problem. The first third of the book is bogged down in exposition, as so often happens with fantasy works, but that’s hardly the worst of it. There are too many unnecessary scenes to list, ones that don’t advance the plot or the characters in meaningful ways, and as it plods across a generation, the story is just too meandering: many events seem like little more than everyday life, and although there’s some intrigue after the first third, many story elements that are supposed to be mysterious and suspenseful just aren’t. Overall, the book has very little energy, and the reader very well find himself waiting for something meaningful to happen, something important, but little does, and Forging the Darksword ends up feeling like little more than tedious setup for the second book. It piques the interest here and there, but has trouble ever sustaining it. The characters are also problematic. Joram isn’t the slightest bit interesting or sympathetic, which is a major deal-breaker given that the trilogy centers around him. Saryon is certainly both, but he’s too passive to have the story center around him. Simkin is a vaguely amusing caricature of Orczy’s Sir Percy Blakeney, and the sort of deus ex machina character these authors like to keep in their back pocket at all times. No one else is remotely compelling; the authors are so secretive about Vanya’s machinations that it’s hard to stay interested in what he’s actually up to. As a fan of the Dragonlance and Death Gate Cycle series, I found Forging the Darksword to be a considerable disappointment. There are sparks of life here, but they aren’t enough for me to continue with this series.